Wondering whether this is just-another hep shirt? Well, look at the equalizers. They are for real. 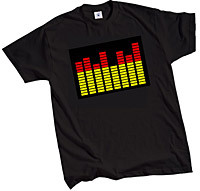 The T-shirt actually reacts to the music it ‘hears’!! Called T-Equaliser, the T-shirt has a little mini battery pack, hidden in a pocket just inside the hem. And this battery powers the gleaming LEDs on the equalizer. Unplug the battery pack before washing. Do not iron over plastic area. Priced at 19.95 British Pounds, I am sure this is going to be a super hit with party-animals!